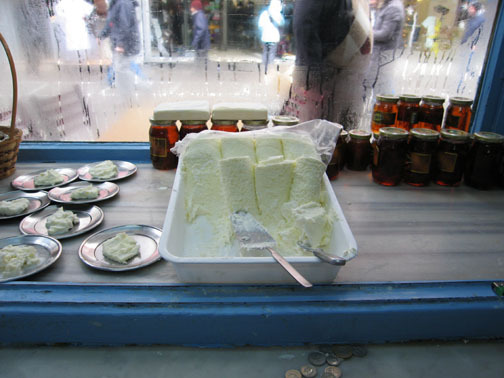 In our imagination, kaymak – the delicious Turkish version of clotted cream – is the only food served in heaven, where angels in white robes dish out plate after plate of the cloudlike stuff to the dearly departed, who no longer have to worry about cholesterol counts and visits to the cardiologist. Perhaps we’re getting carried away, but kaymak can do that to you. For our money, the classic Turkish combo of kaymak served with honey and crusty white bread is one of the finest breakfasts anywhere. The stuff is glorious, but simple. Milk – preferably from domesticated water buffaloes, known as “manda” in Turkish – is slowly boiled until a thick layer of very rich, pure, white cream forms at the top. After it cools, the kaymak is rolled up into little logs that have a consistency that hovers somewhere in between liquid and solid, with a creamy taste that’s both subtle and rich at the same time. The stuff is also quite delicate, with a shelf life of barely one day. Still, purists refuse to refrigerate it, lest it lose its texture and pick up any refrigerator odors. Like we said, kaymak can make people get carried away. Beşiktaş Kaymakçı – This tiny shop/eatery has been in business since 1895, and it certainly shows its age. The marble counter is cracked and the paint on the walls peeling. 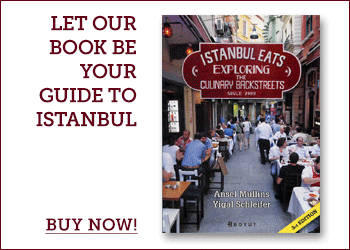 But the kaymak, served up by the 84-year-old Pando, a living institution in Istanbul’s untouristed Beşiktaş bazaar, is out of this world. Prices here also seem unchanged since 1895: a plate of kaymak and honey, served with fresh bread and a glass of steaming hot milk, will set you back 4 lira. Karaköy Özsüt – Compared to Pando in Beşiktaş, this place – open since 1915 – is a relative newcomer to the kaymak scene. Located near the Karaköy waterfront, Özsüt also serves up very good kaymak (as well as yogurt and rustic cheeses) made from the restaurant’s own herd of water buffaloes, whose pictures grace the walls. I am totally obsessed with kaymak and had it for breakfast on bread with honey nearly every day I was in Istanbul. I also had a generous scoop on lots of candied fruits like pumpkin (kabak tatlisi) So good, so fattening and so worth it! There is a great 3rd generation kaymak stop in Kumkapi (close to the restaurants). Also very much the real deal. I was in Istanbul recently and came across the little blue shop you describe. It was an unbelievable breakfast. I have some friends going over soon and I want to tell them how to get to it. Are you fairly sure that street name is right? Koyici Meydani Sok, I mean. I had lunch at a durum place opposite that is also well known in the area. Glad you found the place and enjoyed it. It’s one of our all-time favorite places. We’re fairly sure that’s the right address, but we’ll double check. 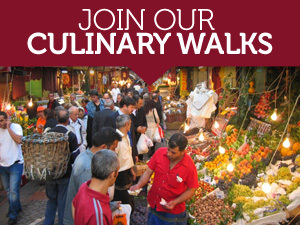 It’s a very well known spot, so if all else fails, tell your friends to just go to the Besiktas market and as for “kaymakci Pando”. We haven’t had a chance to physically check the address. The best way to get there is to find your way to the big statue of the eagle, which is in the middle of the Besiktas market, and then ask for “Kaymakci Pando.” Everybody knows him. Good luck. Not sure of the exact time, but they are certainly open by 9am, perhaps even earlier. Went to the Besiktas Kaymakci today. Amazing! Correct address is Mumcu Bakkal Sokak no. 5. Hi- went to this place last week. It was amazing- totally as advertised, though impossible to get to with above address so we had to ask. Turns out it is very easy. Get to the eagle, stand right in front of him go down the street to the left and Kaymakci Pando is 1 from the corner on the left. Soooo good. Totally heavenly kaymak, a place not to miss. I stumbled across this post this morning and was stunned to discover that Pando’s is only about 10 minutes from where I live. I’d walked by it dozens of times without noticing. Heavenly is right. Today, my wife and I decided to try the place and ordered two plates of kaymak (not more than 50 grams of kaymak per plate), two tried eggs, two glasses of tea and bread and he tried to charge us 30TL for the entire affair…. 30TL?! Amanda, If you would look closely at this article you might notice that is was written in 2009. Exactly 5 years ago today! The 30TL for breakfast (for 2) does not seem as outrageous by today’s standards if you consider that it was 4TL (a single serving) in ’09. A breakfast anywhere else for $14 (for 2 people) doesn’t seem so bad. You must realize that inflation has taken affect and the fact that so many have written about this restaurant is bound to make a difference in the cost. To give a poor review to a restaurant because you think you’ve been overcharged without taking into account the 5 year lapse and the fact that the service was for 2 is outrageous. Shame on you! 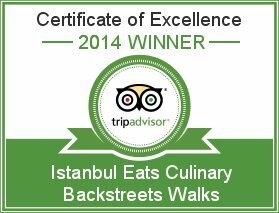 This is actually one of the first posts ever on Istanbul Eats (which celebrated its fifth birthday yesterday), so the prices are certainly out of date. This place is such an institution and Pando such a treasure that we’re willing to put up with his occasional price fluctuations. I went to Pando this morning on the third day of a long weekend in Istanbul. Kaymak was everything I imagined, and more. So wonderful. Also, for people curious about price – 1 kaymak with honey and 2 teas were 8 lira. Since the waiter had no change, he charged us 6.5. Also, I have been using your site as my guide for the trip, and every recommendation is a bullseye. Thanks for your work! Nov 28, 2013 : Thanksgiving in Turkey • Where Is Your Toothbrush?